As the weather gets warmer I want to have cooler foods. I especially love pasta salads. I will not argue the nutritional value of pasta, but just say it is delicious! 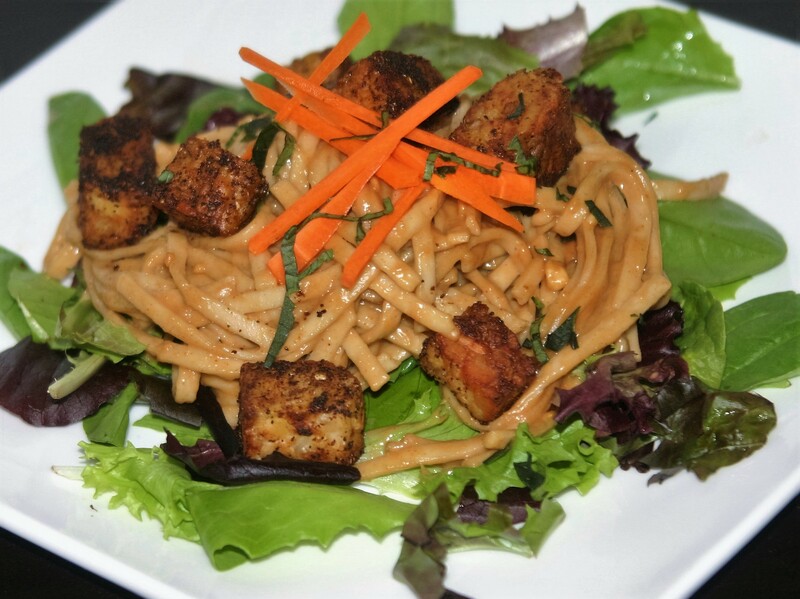 This is a simple noodle salad topped with tempeh croutons and it gets better after a day or two in the fridge. It is also perfect for a pot luck as it is best served room temperature. This comes together quickly, and is perfect for lunch on the go, or a quick dinner. Serve with a yummy fresh salad to really brighten your meal. In a large bowl combine the peanut butter, lime juice, brown sugar, tamari, and red pepper flakes whisking to combine.